The Bones, Muscles, and Movement Honor is a component of the Health Master Award . 1 1. What's the difference between exoskeletons and endoskeletons? Which type of skeleton do humans have? 2 2. List three functions of the skeletal system. 3 3. Is bone a living tissue? Explain why or why not. 4 4. Describe the structure and development of bone. 5 5. Identify the following bones of the skeletal system: Carpals, clavicle (collar bone), coccyx (tail bone), cranium, femur, fibula, humerus, mandible, maxillary bones, metacarpals, metatarsals, patella, pelvis, phalanges, radius, ribs, scapula (shoulder blade), sternum (breast bone), tarsals, tibia, ulna, and vertebrae. 6 6. What is a joint? 7 7. List three types of joints found between bones. 8 8. 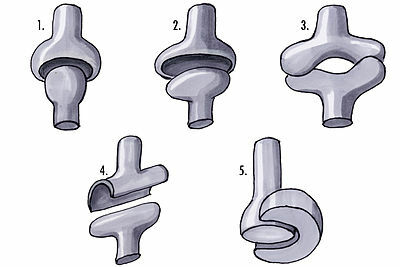 Name and describe six types of freely movable joints. Be able to locate an example of each of these in your body. 9 9. Be creative and construct a model of one of the six freely movable joints. 10 10. What is another name for a broken bone? List 3 types of breaks that can occur in bones. Describe how bones heal and how doctors can help this process. 11 11. What is osteoporosis? Who can get it? List at least 5 health habits that deal with maintaining healthy bones and muscles. 12 12. What is the function of the muscular system? 13 13. Name and describe three types of muscles tissue, Give one example of each. 15 15. Describe the process that causes a muscle to contract. 16 16. Describe the difference between voluntary and involuntary muscles. 17 17. Using your model in #9, show how muscles, bones, and joints work together to produce movement. 18 18. Find 3 texts in the Bible that mention bones and/or muscles. Tell about each one in your own words. 1. What's the difference between exoskeletons and endoskeletons? Which type of skeleton do humans have? An exoskeleton is a hard shell on the outside of a creature (such as an insect or a lobster). An endoskeleton is the system of bones on the inside of a creature (such as a human, dog, cat, or a bird). 2. List three functions of the skeletal system. The skeletal system provides support to a body. Without a skeleton, a Pathfinder would be a shapeless blob. The marrow inside bones produces blood cells. The skeletal system protects the internal organs from physical harm. Bones serve as a place where the body can store minerals for later use. Bones also serve as levers against which the muscles pull to accomplish motion. 3. Is bone a living tissue? Explain why or why not. Bone is living tissue. Were it not so, it could not produce blood cells, nor could bones heal after being broken. Bones cells continually regenerate themselves. 4. Describe the structure and development of bone. Bone is a relatively hard and lightweight composite material, formed mostly of calcium phosphate. It has relatively high compressive strength but poor tensile strength. While bone is essentially brittle, it is somewhat elastic due to its organic components (chiefly collagen). Bone has an internal mesh-like structure, the density of which may vary at different points. Bone can also be either woven or lamellar. Woven bone is put down rapidly during growth or repair. It is so called because its fibres are aligned at random, and as a result has low strength. In contrast lamellar bone has parallel fibres and is much stronger. Woven bone is often replaced by lamellar bone as growth continues. Bone growth begins with points in the cartilage. Most bones appear during fetal development, though a few short bones begin primary ossification after birth. Secondary ossification occurs after birth, and forms the ends of the long bones (the epiphyses) and the outer parts of irregular and flat bones. The main shaft (diaphyses) and the ends of long bones remain separated by a growing zone of cartilage (the metaphysis) until the child reaches skeletal maturity (18 to 25 years of age), which is when the cartilage ossifies, fusing the two together. Marrow can be found in many of the larger bones. In newborns, all such bones are filled exclusively with red marrow, but as the child ages it is mostly replaced by yellow marrow (or fatty marrow). In adults, red marrow is mostly found in the flat bones of the skull, the ribs, the vertebrae and pelvic bones. 5. Identify the following bones of the skeletal system: Carpals, clavicle (collar bone), coccyx (tail bone), cranium, femur, fibula, humerus, mandible, maxillary bones, metacarpals, metatarsals, patella, pelvis, phalanges, radius, ribs, scapula (shoulder blade), sternum (breast bone), tarsals, tibia, ulna, and vertebrae. Carpals are bones found in the hand. They are also called wrist bones as they are in the wrist. There are eight carpals in each hand. The Clavicle or Collarbone is a long bone that serves as a strut between the scapula and the sternum. It is the only long bone in the body that lies horizontally. It makes up part of the shoulder and the pectoral girdle, and is palpable in all people; in people who have less fat in this region, the location of the bone is clearly visible, as it creates a bulge in the skin. It receives its name from the Latin: clavicula ("little key") because the bone rotates along its axis like a key when the shoulder is abducted. The skull or cranium bone is a bony structure in the head of most vertebrates (in particular, craniates) that supports the structures of the face and forms a protective cavity for the brain. The skull is composed of two parts: the cranium and the mandible. The skull forms the anterior most portion of the skeleton and is a product of encephalization, housing the brain, many sensory structures (eyes, ears, nasal cavity), and the feeding system. Functions of the skull include protection of the brain, fixing the distance between the eyes to allow stereoscopic vision, and fixing the position of the ears to help the brain use auditory cues to judge direction and distance of sounds. In some animals, the skull also has a defensive function (e.g. horned ungulates); the frontal bone is where horns are mounted. The skull is made of a number of fused flat bones. The femur or thigh bone, is the most proximal (closest to the center of the body) bone of the leg in tetrapod vertebrates capable of walking or jumping, such as most land mammals, birds, many reptiles such as lizards, and amphibians such as frogs. In vertebrates with four legs such as dogs and horses, the femur is found only in the rear legs. The head of the femur articulates with the acetabulum in the pelvic bone forming the hip joint, while the distal part of the femur articulates with the tibia and patella forming the knee joint. By most measures the femur is the strongest bone in the body. The femur is also the longest bone in the body. The fibula or calf bone is a leg bone located on the lateral side of the tibia, with which it is connected above and below. It is the smaller of the two bones, and, in proportion to its length, the slenderest of all the long bones. Its upper extremity is small, placed toward the back of the head of the tibia, below the level of the knee joint, and excluded from the formation of this joint. Its lower extremity inclines a little forward, so as to be on a plane anterior to that of the upper end; it projects below the tibia, and forms the lateral part of the ankle joint. The humerusis a long bone in the arm or forelimb that runs from the shoulder to the elbow. Anatomically, in modern humans, it connects the scapula and the lower arm (consisting of the radius and ulna), and consists of three sections. The upper extremity consists of a rounded head, a narrow neck, and two short processes (tubercles, sometimes called tuberosities.) Its body is cylindrical in its upper portion, and more prismatic below. The lower extremity consists of 2 epicondyles, 2 processes (trochlea & capitulum), and 3 fossae (radial fossa, coronoid fossa, and olecranon fossa). As well as its true anatomical neck, the constriction below the greater and lesser tubercles of the humerus is referred to as its surgical neck due to its tendency to commonly get fractured, thus often becoming the focus of surgeons. The mandible,is a lower jaw or jawbone is a bone forming the skull with the cranium. In lobe-finned fishes and the early fossil tetrapods, the bone homologous to the mandible of mammals is merely the largest of several bones in the lower jaw. In such animals, it is referred to as the dentary bone, and forms the body of the outer surface of the jaw. It is bordered below by a number of splenial bones, while the angle of the jaw is formed by a lower angular bone and a suprangular bone just above it. The inner surface of the jaw is lined by a prearticular bone, while the articular bone forms the articulation with the skull proper. Finally a set of three narrow coronoid bones lie above the prearticular bone. As the name implies, the majority of the teeth are attached to the dentary, but there are commonly also teeth on the coronoid bones, and sometimes on the prearticular as well. The maxillae,is consist of upper palate of mouth or maxilla or two halves that are fused at the intermaxillary suture to form the upper jaw. This is similar to the mandible (lower jaw), which is also a fusion of two halves at the mandibular symphysis. The Metacarpus is the intermediate part of the hand skeleton that is located between the phalanges (bones of the fingers) and the carpus which forms the connection to the forearm. The metacarpus consists of metacarpal bones. Its equivalent in the foot is the metatarsus. The metatarsus or metatarsal bones are a group of five long bones in the foot, located between the tarsal bones of the hind- and mid-foot and the phalanges of the toes. Lacking individual names, the metatarsal bones are numbered from the medial side (the side of the great toe): the first, second, third, fourth, and fifth metatarsal (often depicted with Roman numerals). The metatarsals are analogous to the metacarpal bones of the hand. The lengths of the metatarsal bones in humans are, in descending order: second, third, fourth, fifth and first. This image shows all the bones listed above. It should be noted that the maxillary bones are the bones of the face. Also note that the ulna connects to the humerus and is larger than the radius. The radius connects to the ulna. The phalanges are both the finger bones and the toe bones. 6. What is a joint? A joint is the place where two bones come into contact with one another. 7. List three types of joints found between bones. Fibrous joints are where the bones are connected together by a fibrous connective tissue. These joints allow for little to no movement. An example of fibrous joints are the joints between the various bones in the cranium. Cartilagenous joints are connected by cartilage. These joints allow for little movement. An example of a cartilagenous joint is the joint between the ribs and the sternum. Synovial joints are separated by an empty space called a synovial cavity. These joints allow the most movement. Examples of a synovial joints are the elbow and the knee. 8. Name and describe six types of freely movable joints. Be able to locate an example of each of these in your body. Ball and Socket joints can be found in the hip. These joints allow for movement in many directions. Ellipsoid joints can be found in the knee. When the knee is extended, it does not allow rotation. When it is flexed, it allows for limited rotation. Saddle joints can be found in the fingers and thumbs. Hinge joints can be found in the elbow between the humerus and the ulna. A hinge joint works just like a door hinge, allowing motion in only one direction. Pivot joints can also be found in the elbow between the ulna and the radius. This type of joint allows one bone to rotate about the other. Gliding joints can be found between the carpals in the wrists. These joints allow limited movement between the bones as one glides past the other. 9. Be creative and construct a model of one of the six freely movable joints. Form the bones with clay and then let them harden. Cover wooden dowels with papier-mâché. Make a wire frame and cover that with papier-mâché. Carve bones out of soft wood (such as balsa or pine). Make an impression in wet sand and fill with plaster. Make cross-sections out of paperboard and glue them together. Make the bones from sugar cookie dough and then bake them (a saddle joint or gliding joint works best for this approach). Use Pathfinders to model the bones and muscles in a joint. A simpler joint like the elbow is easiest. Make sure each Pathfinder knows the name and function of the body part he/she is modeling. Be sure to review requirement 17 before starting. It's important to know how this model will be used during the design phase. 10. What is another name for a broken bone? List 3 types of breaks that can occur in bones. Describe how bones heal and how doctors can help this process. Another name for a broken bone is "fracture." There are two main types of fractures, open and closed. In an open fracture (also called a compound fracture), the bone protrudes through the skin. This is a very serious condition as it allows infection to enter the body. In a closed fracture (also called a simple fracture), the bone stays inside the body. Transverse - the break in the bone is at a right angle to the long axis of the bone. Comminuted - the bone breaks into three or more pieces. Greenstick - the bone breaks on one side, and the other side is bent. This is very similar to what happens when a green twig is snapped: it doesn't come all the way apart, but it is clearly broken on one side. Stress - a hairline crack in the bone. The bone does not separate into two pieces. Living bones are in constant change. Cells die and are replaced on a regular basis. Because of this, a bone will heal all by itself if allowed to. Doctors can help this process in two ways. First, they can set the bone. This is done by making sure the pieces of the bone are aligned properly. In a comminuted fracture this may involve surgery. The second way that doctors help bones to heal is by immobilizing them - that is, keeping them from moving around. This can be done by surrounding the broken limb with a cast, or it can be done by embedding pins inside the body. Some bones do not need to be immobilized when broken (such as the nose). 11. What is osteoporosis? Who can get it? List at least 5 health habits that deal with maintaining healthy bones and muscles. Avoid soft drinks, especially those containing phosphoric acid. Maintain a healthy body weight. Those with abnormally low body weight are more susceptible to osteoporosis. Make sure your diet has plenty of calcium. Make sure your diet has plenty of vitamin D.
12. What is the function of the muscular system? The muscular system is the system in humans and in animals that facilitate motion. This motion can be either internal (a beating heart) or external (walking). 13. Name and describe three types of muscles tissue, Give one example of each. Cardiac muscles are found only in the heart. These muscles are what make your heart beat. Cardiac muscles are the only muscles in the body consisting of branching fibers. Skeletal muscles are attached to the skeleton and are responsible for voluntary (and sometimes involuntary) bodily movement. Smooth muscles are responsible for internal, involuntary (and sometimes voluntary) movement of the organs such as breathing and moving food through the digestive tract. Masseter, Trapezius, Deltoid, Pectoralis, Biceps, Abdominal, Quadriceps, Triceps, Latissimus dorsi, Gluteus maximus, Hamstrings, Gastrocnemius, and Soleus. The trapezius, triceps, latissimus dorsi, gluteus maximus, hamstrings, gastocnemius, and soleus are located on the back of a human, and the arrows indicate their location. The gluteus maximus is more commonly known as the buttock. The gastrocnemius and soleus muscles are considered to be the same muscle by some anatomists because they share a tendon. The soleus is beneath the gastrocnemius which is closer to the skin. Together, they form the muscle more commonly known as the calf. 15. Describe the process that causes a muscle to contract. When the muscle is in a resting state, thin strands of a protein called tropomyosin are wrapped around the actin filaments, blocking the myosin binding sites. This keeps the myosin from binding to actin. Molecules called troponin are attached to the tropomyosin. When calcium is introduced into the muscle cell, calcium ions bind to troponin molecules. Calcium then pulls troponin, causing tropomyosin to be moved as well, therefore causing the myosin binding sites on the actin to be exposed. Myosin binds to the now-exposed binding sites. As soon as the myosin head binds to actin, the head bends at its hinge. Once the head bends, the myosin loses energy, and remains attached to the actin. When re-energized by adenosine triphosphate (ATP), the myosin head detaches from the actin filament, and is ready to attach and bend again. The collective bending of numerous myosin heads (all in the same direction), combine to move the actin molecules closer together. This results in a muscle contraction. 16. Describe the difference between voluntary and involuntary muscles. Voluntary muscles are attached to the skeletal frame and are generally under the control of the person to whom they belong. These are the muscles in the arms and legs (and elsewhere). Involuntary muscles are controlled by the autonomic system without the conscious control by the individual. Your heart continues to beat, you continue to breathe, and you digest your food even when you are not thinking about it. 17. Using your model in #9, show how muscles, bones, and joints work together to produce movement. Please note that the answers given here are only possibilities. If you know a creative way to do this, you are encouraged to add it. Use rubberbands or elastic as muscles. Stretch them such that the joint can be moved by hand and then snap back into position when the rubber band (muscle) contracts. If you use cookie dough, you may have a hard time keeping the bones from breaking. You may wish to form the dough around something a little more substantive, such as a dowel, a stick of celery, or perhaps a carrot. In this case you may use Twizzlers as muscles. Although they will not contract, they look kind of like muscles and taste pretty good. If you use clay, plaster, or papier-mâché, be sure to make anchor points for the muscles before the "bones" harden. Try using cup hooks or eye hooks for this purpose. If using a wire frame, you can make the anchors out of the wire. If you use Pathfinders to model the joint, have them pull alternately (since muscles do not push) on the Pathfinders who are modeling the bones of the joint, to achieve the proper motion of the joint in all of its proper directions. This is usually more easily achieved if everyone is lying down, so gravity is less of a factor. 18. Find 3 texts in the Bible that mention bones and/or muscles. Tell about each one in your own words. Note: In many translations of the Bible, the term "flesh" is used to describe muscles. Here are several passages featuring bones and muscles. Encourage your Pathfinders to look through more than the required three verses. It will be easier for them to describe the passage in their own words if they have made a connection with the verses. This page was last edited on 15 December 2018, at 04:10.